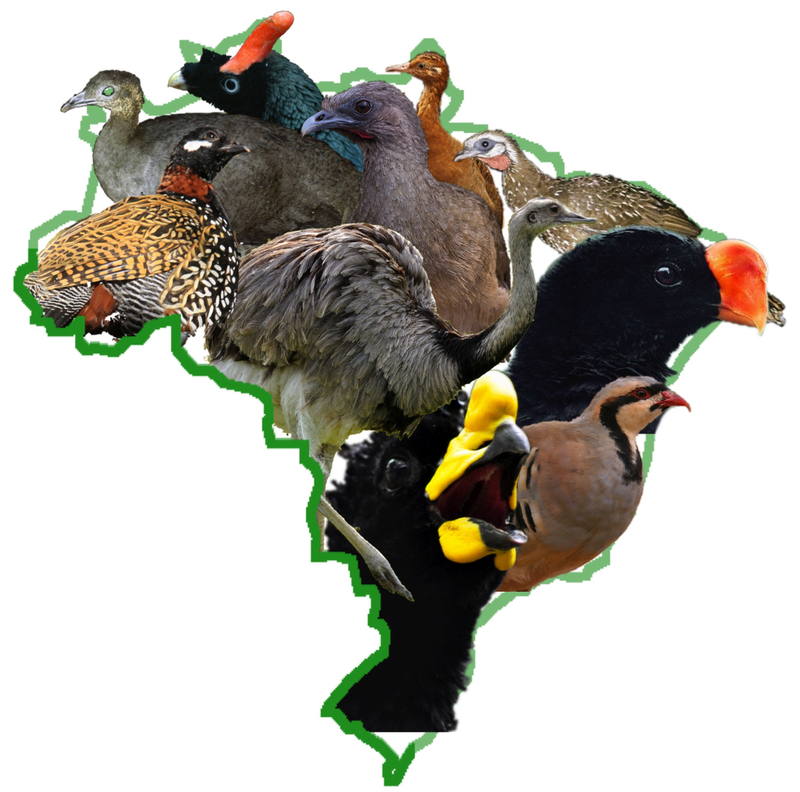 The task will be focused on bird identification based on different types of audio records over 999 species from South America centered on Brazil. Additional information includes contextual meta-data (author, date, locality name, comment, quality rates). The main originality of this data is that it was built through a citizen sciences initiative conducted by Xeno-canto, an international social network of amateur and expert ornithologists. This makes the task closer to the conditions of a real-world application: (i) audio records of the same species are coming from distinct birds living in distinct areas (ii) audio records by different users that might not used the same combination of microphones and portable recorders (iii) audio records are taken at different periods in the year and different hours of a day involving different background noise (other bird species, insect chirping, etc). The data will be built from the outstanding Xeno-canto collaborative database (http://www.xeno-canto.org/) involving at the time of writing more than 192k audio records covering 9120 bird species observed all around the world thanks to the active work of more than 2020 contributors. 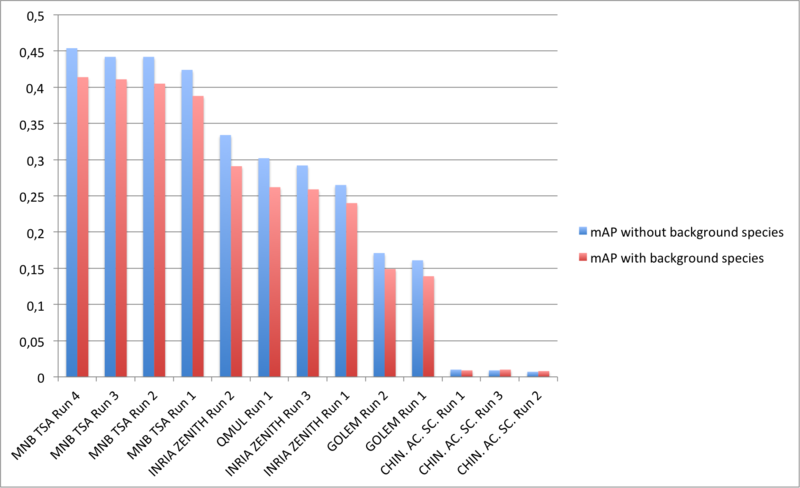 - minimally 10 different recordists, maximally >40, per species. In order to avoid any bias in the evaluation related to the used recording devices, the whole audio data has been normalized by Univ. Toulon Dyni team: normalization of the bandwith / frequency sample to 44.1 kHz, .wav format (16 bits). Submitting a working note with the full description of the methods used in each run is mandatory (deadline is May 31st). Any run that could not be reproduced thanks to its description in the working notes might be removed from the official publication of the results. Working notes are published within CEUR-WS proceedings, resulting in an assignment of an individual DOI (URN) and an indexing by many bibliography systems including DBLP. According to the CEUR-WS policies, a light review of the working notes will be conducted by LifeCLEF organizing committee to ensure quality. 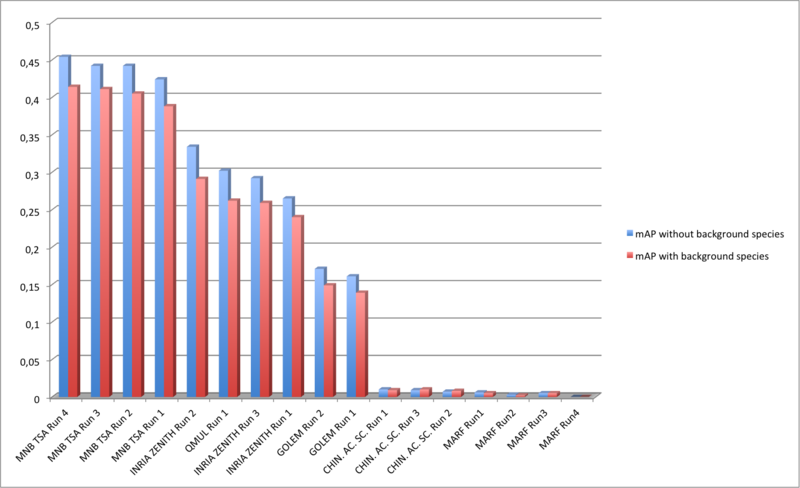 Among the 130 registered groups worldwide who downloaded the data, 6 of them submitted a total of 17 runs. Thanks to all of them for their efforts.